This guide will cover how to request ETS lab work, print labels, and retrieve the data from ETS via the Lab Console. To request lab work for a single wine use the Actions > Print lab label option when looking at the wine in the product overview. To request lab work for multiple wines, use the Bulk wine search (Search > Advanced Searches > Bulk wine search). For basic information on using the Bulk wine search, click here. You may also create saved searches and add them to your My Searches on your dashboard. To speed up ETS making requests you can also set up analysis templates matching the ETS panels you are requesting. 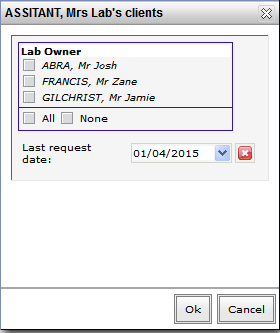 Labels can be printed when requesting the lab work or by printing them in Consoles > Labs. You will need to use these ETS labels when requesting lab work, if you would like to use alternative labels please contact support for advice. 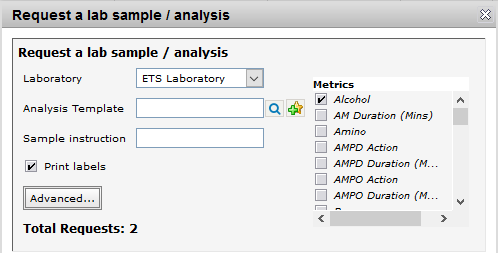 Once your ETS lab requests have been created, head into the lab console and select ETS as the lab. There is a link that gets activated when the ETS lab is selected. If the laboratory has only one client, it will retrieve its data right away. Otherwise, a pop up window will appear asking to select the clients to process results for. 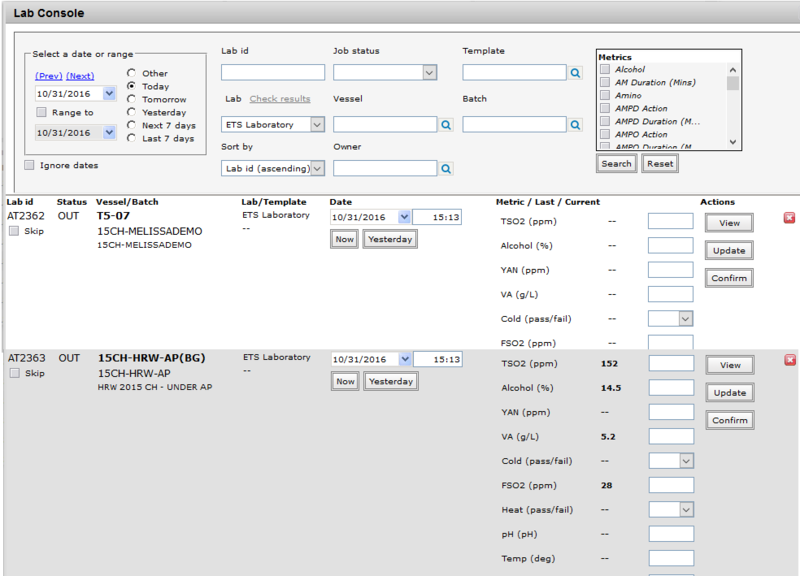 Once the client has been selected, the analysis metrics data will appear on the lab console screen ready to be processed. If there is no record to process, a error message with following message will appear: “The Lab request ids supplied in the file have either all been completed, cancelled, or are invalid”. Please contact support if you receive any other error messages that you are not sure about.